If nothing else makes me want to see this movie more than wanting to see these chimpanzees it would be to help save Chimpanzees, during its opening weekend in support of the Jane Goodall Foundation partnership. For every moviegoer who sees CHIMPANZEE during the film’s opening week (April 20-26, 2012), Disneynature will make a donation to JGI through the Disney Worldwide Conservation Fund in order to protect chimpanzees and their habitats, now and into the future. 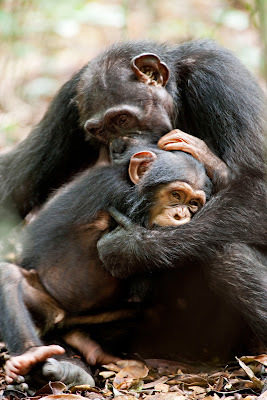 Fact #4: Scientists have discovered that chimpanzees living in different parts of Africa have distinct customs or cultural traits that are passed along from one generation to the next by learning rather than instinct. Chimpanzees are just amazing - intelligent and unique! There is so much - so so much - more to learn about them! Wow, this picture looks like Ghost Cat!!! Very cool!!! Mom is hoping to find some time in the little bipeds busy schedule to take them to see the movie too. That looks like a mama holding her baby. Something about the picture brings tears to my eyes. I bet it will be a wonderful film. Your two furbabies are so cute! The picture is so touching. I love the animal connection, in all of its forms, as I know you do. Hugs. That movie will be on my MUST SEE list for sure!!! Thanks for posting about it and thanks for your visit! !